If you need some fresh cooking inspiration, this is a good week for you. 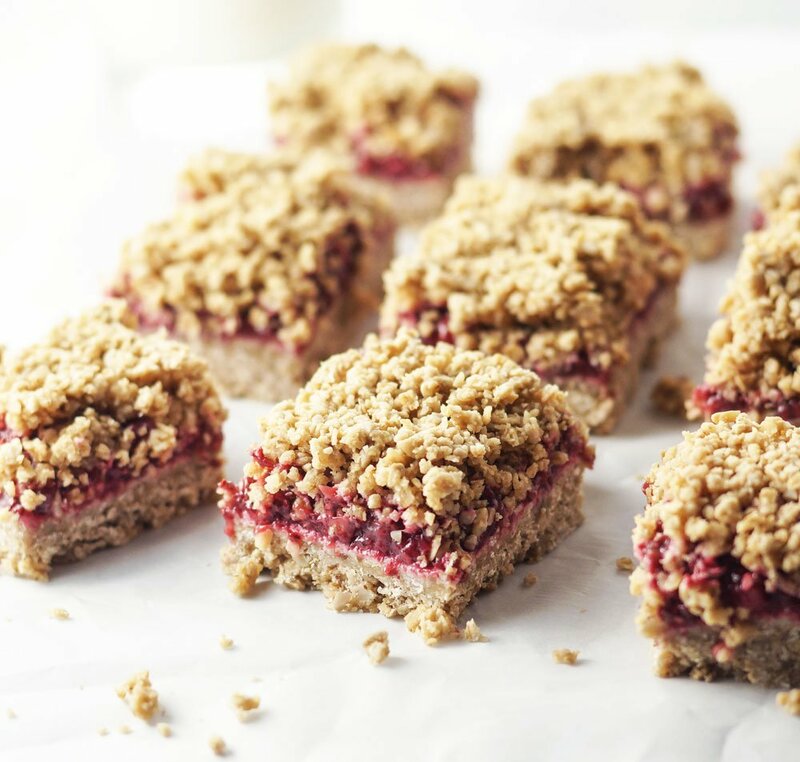 My friend Angela’s second cookbook, Oh She Glows Everyday, hits bookstores this week and it is loaded with plant-based dishes (like these Strawberry Crumble Bars; recipe below!) that aim to make this style of eating convenient every day of the week– even on holidays and special occasions. What I love about Angela’s plant-based recipes is that they celebrate whole food ingredients, rather than relying on packaged veggie burgers or processed soy crumbles. 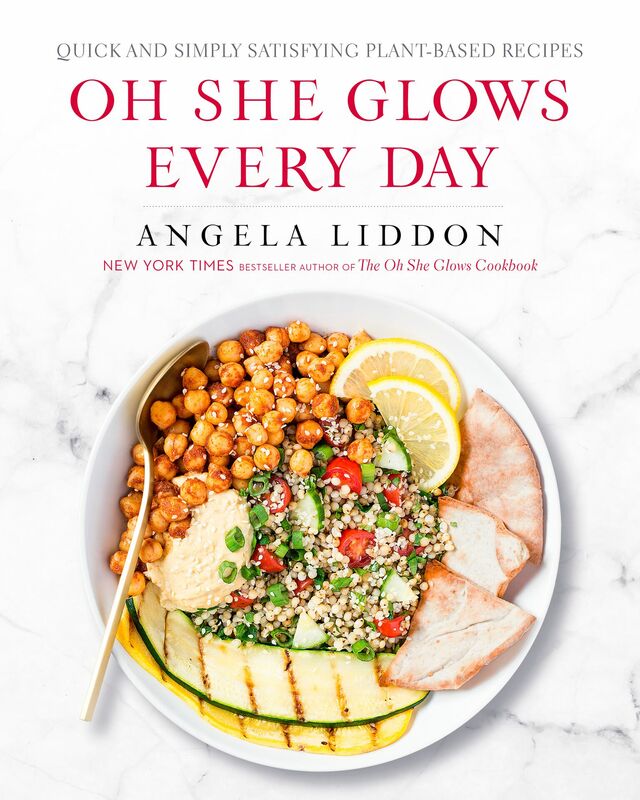 This new book covers a little bit of everything, including recipes like Morning Detox Smoothie, Crowd-Pleasing Caesar Salad, Super Seed Crackers, Golden French Lentil Stew, Eggplant Parmesan, Cookie Dough Balls, and High-Rise Pumpkin Cupcakes. Just like her last book, Angela also includes some recipes for homemade staples and tips to make recipes kid-, freezer-, and allergy-friendly whenever possible. 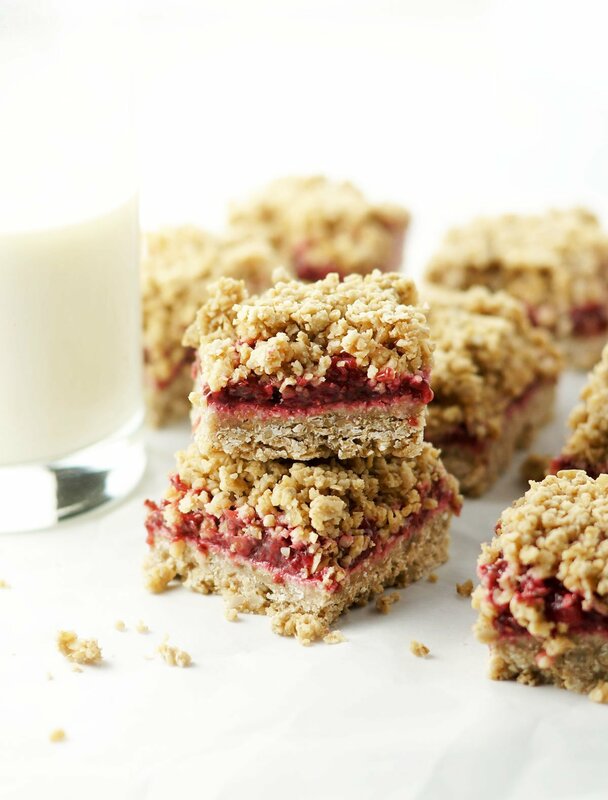 I made these Strawberry Oat Crumble Bars from the new book this past weekend (which are made with a delicious homemade chia jam! ), and Angela has generously allowed me to share the recipe with you all, too. I hope you enjoy them! These delicious “anytime” bars are vegan, lunchbox-friendly, gluten-free, and made with a refined sugar-free strawberry-vanilla chia seed jam. (With the chia jam, the bars will be lightly sweet; if you use store-bought jam, they’ll be much sweeter.) It’s hard to resist gobbling them up once you slice them, but I actually find that they taste better the following day, after the flavors have had a chance to meld in the fridge overnight. I also recommend making the chia jam in advance, so it has time to cool in the fridge before you begin making the recipe. Once chilled, the bars firm up (thanks to the coconut oil), but at room temperature they soften and will virtually melt in your mouth while you eat them! Hubba, hubba. Either way, you are going to go crazy over the roasted sunflower seed “cookie” crust. Enjoy these as a quick breakfast with tea or coffee, as an afternoon snack when you need a boost, or warmed up for dessert with a scoop of ice cream (it’ll remind you of a berry crisp!). A naturally-sweetened fruit crumble bar made with oats and sunflower seeds, and a homemade chia jam. If you have a food processor with less than an 11-cup (2.6 L) capacity, you might need to process the crust in two batches and then stir it all together in a large bowl before measuring. Chia seed jam has been my go-to quick-and-easy jam recipe for years. While not a traditional jam by any means, I certainly don’t miss all the refined sugar of traditional versions when I enjoy this fresh, vibrant spread. You can use any kind of berry you prefer, and have fun changing it up with different mix-ins like lemon juice or zest, orange juice or zest, vanilla bean seeds or extract, cinnamon, cardamom, and any other spices or extracts you enjoy. Since berries vary in terms of sweetness, feel free to adjust the sweetener to suit your own taste with each batch. You’ll be happy to know that chia seed jam also freezes well. I like to portion individual servings into a silicone mini-muffin tray, freeze them until they’re solid, and then pop them out and store them in a freezer bag. This way you can have chia seed jam ready anytime! Simply thaw it in the fridge or at room temperature. If I’m making overnight oats, I will often thaw a cube of chia seed jam in the fridge overnight while the oats thicken. Then it’s all ready for me to enjoy in the morning without any fuss. How’s that for easy? 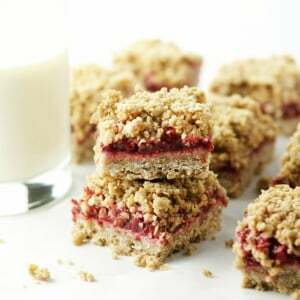 This Chia Seed Jam that is used for the Strawberry Oat Crumble Bars or is delicious on its own! Remove from the heat and stir in the vanilla extract, vanilla bean powder, and lemon juice (if using). Transfer the mixture to a bowl and refrigerate, uncovered, until cool, at least a couple of hours. For quicker cooling, pop the jam into the freezer, uncovered, for 45 minutes, stirring every 15 minutes. The chia seed jam will keep in an airtight container in the fridge for up to 2 weeks. It also freezes well for 1 to 2 months. 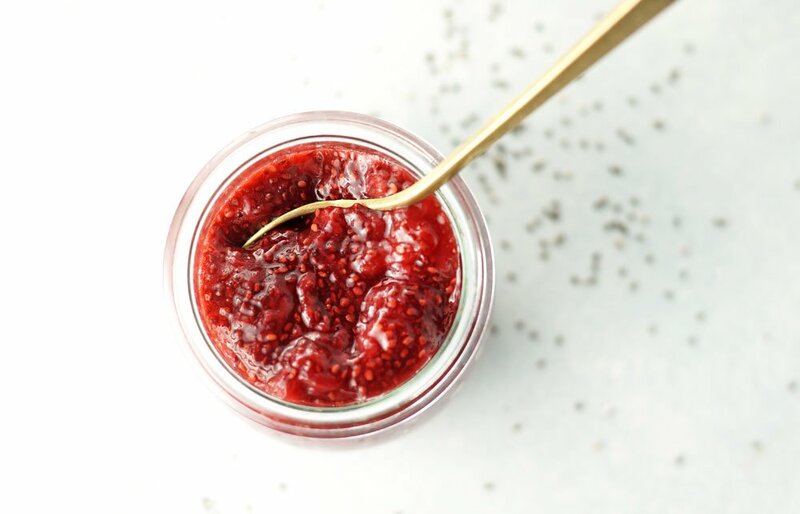 For the Strawberry-Vanilla Chia Seed Jam: Use 3 1/2 cups (875 mL/about 17 ounces/475 g) frozen strawberries, 1/4 cup (60 mL) pure maple syrup, a dash of salt, 2 tablespoons (30 mL) chia seeds, 1 teaspoon (5 mL) fresh lemon juice, and 2 seeded vanilla beans or 1/2 teaspoon (2 mL) pure vanilla bean powder. For the Raspberry-Almond Chia Seed Jam: Use 2 1/2 cups (625 mL/ 10 ounces/300 g) frozen or fresh raspberries, 1/4 cup (60 mL) pure maple syrup, 2 tablespoons (30 mL) chia seeds, 1/4 teaspoon (1 mL) pure almond extract, and a pinch of fine sea salt. I hope you enjoy the new recipes! Reader Feedback: What’s your favorite plant-based recipe lately? The Berry Chia Jam is the only one I make since discovering this recipe. As I was making a batch today, I wondered if you’ve tried it in the Instant Pot? Seems it would be so adaptable so one doesn’t have to watch to make sure it doesn’t stick to the pan. ~~~ just a thought! Another amazing recipe! I love every recipe I’ve ever tried on your site! This one is another winner. Comes together really easily/quickly and tastes unbelievably good. No one would know it was healthy. I also like that it is nut free so I can send it to school with my daughter. I didn’t make it nut-free this time, however, since I didn’t have sunflower seed butter on hand, so I used almond butter (and it’s summer, so didn’t have to worry about school snacks!). I also subbed in some natural strawberry jam that I needed to use up, but would love to try it with the chia jam next time. I only had about 200 ml of jam and it worked perfectly. Oh – and I also had a smaller food processor, but just followed your suggestion and did it in parts, then mixed it all together at the end. The recipe is basically foolproof 😉 Thanks again for such a delicious recipe – I am really going to have to check out your cookbook! Can I use vanilla extract instead of the powder for the strawberry jam? I’ve had something similar (but with blueberries instead) with vegan vanilla ice-cream and it was amazing!! My favorite is honey balsamic roasted cauliflower. But these oat bars are fabulous. I make the magical vanilla blueberry version of her chia jam. Delightful on waffles!! Congratulations on your baby!!!!!!!!!!! Get some rest. Put your feet up and enjoy your newest family member! !